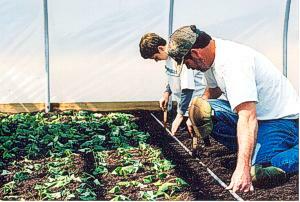 Jones Family Farms has a separate greenhouse for the varieties obtained from the NC State University Micropropagation Unit. 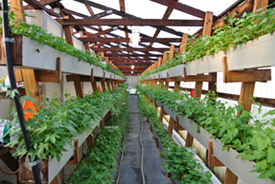 A wood-frame greenhouse measuring 20' X 80' features one-third of the center area screened in for mother plants. 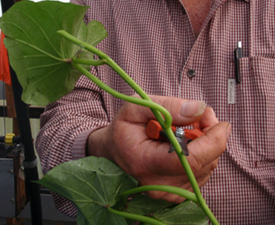 Each greenhouse features electricity on thermostats and automatic timers for water and fertilizing. Before entering each greenhouse, everyone goes though a double-entry area for sterilization with a fogging system that completely covers the body to prevent insects and diseases from entering the greenhouse. Stepping in a bleach-filled tub isn't enough. 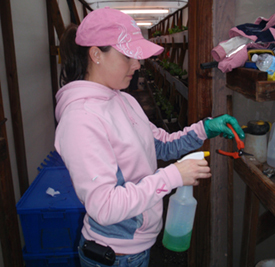 At the start of each growing season, we sterilize everything with a Clorox/Oxidate/fungicide/spore killer mixture to make sure the greenhouse is ready for new mother plants to be micropropagated. Around the first week of February, several different varieties of plants are picked up from the NC State Micropropagation Unit. All of the varieties are color-coded. 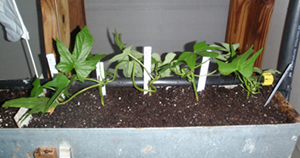 Mother plants are immediately cut, if needed, and then replanted in gutters to make sure the new plants aren't root bound and have room to grow. 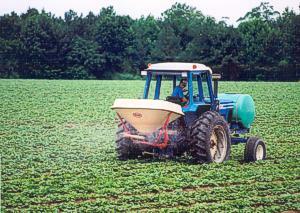 Clippers are sprayed with alcohol before cuttings are made to make sure viruses aren't transmitted to the plants. As they grow, we take two node cuttings from each first daughter plant, which will be planted in another greenhouse with the same variety. 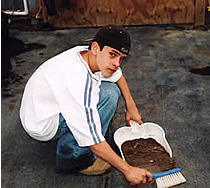 Each of the greenhouses has ground cover and gravel on the floor for drainage, as well as drain lines that run underground to remove any standing water. 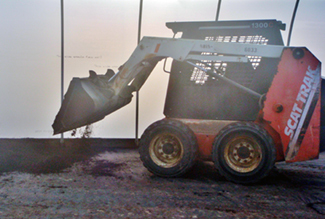 Jim and Jimmy punch holes in the soil ready for second daughter cuts. 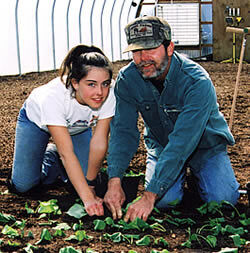 Second daughter cuts are then spaced and planted in six inch rows, with each plant about four inches apart. 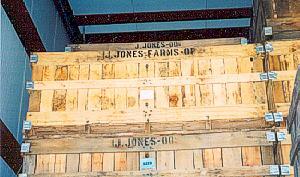 The Jones operation has the capacity to grow about 18,000-20,000 plants in each greenhouse. 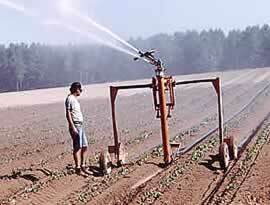 Jim adjusts irrigation pipes to water second daughter plants. Second daughter plants are now ready for transplanting and will soon produce seed stock in the field. 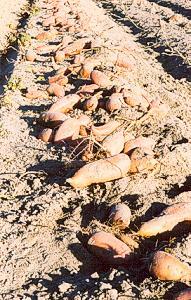 Prior to planting, soil in all the sweet potato fields is sampled and metered to determine what nutrients are needed to grow a good crop. 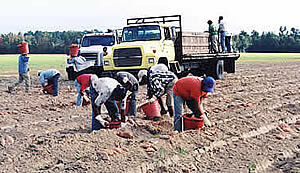 Starting about the first or second week of May, plants are cut every eight to nine days for seven to 10 weeks for transplanting in the fields. 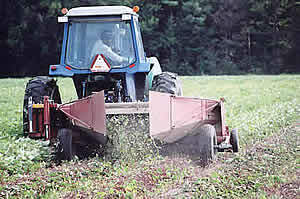 Select cutting with clippers is used to get the biggest plants to grow. 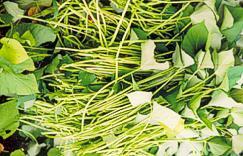 Smaller plants are given time to get bigger before weekly cuttings and transplanting to the field. 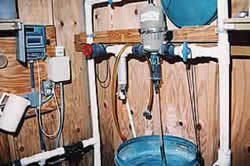 Irrigation is key to growing quality plants and assuring a good stand. 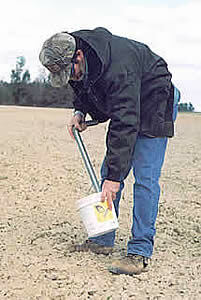 To get a good, uniform stand, a grower must irrigate if there has been no rainfall. 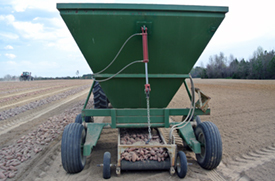 Applying side-dress fertilizer four weeks after transplanting will help ensure us of a good, high yield of uniform #1 sweet potatoes. 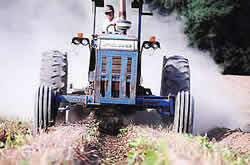 Mowing vines eight to 10 days before digging with plow. 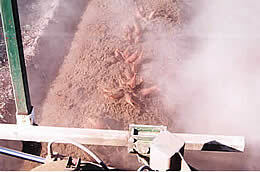 Bins and buckets are sterilized before harvest time. 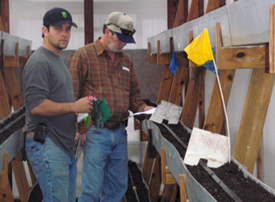 Each harvesting crew separates seeds from #1's, carefully handling them as they are placed in bins for storage. 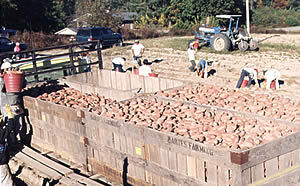 In the curing shed, sweet potatoes are cured and stored over winter. 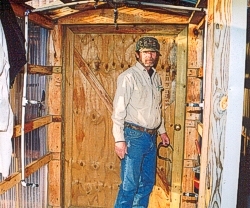 They are kept for four to five days at 85 degrees and 85 percent humidity and then kept to 58 degrees at 85 percent humidity for the rest of the time in the curing barn. 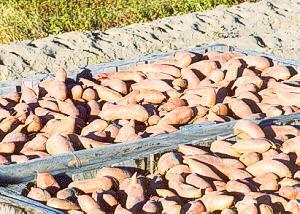 With the right micropropagated seeds or plants, good weather, and God willing, Jones Family Farms will have the very best crop of sweet potatoes under rows. 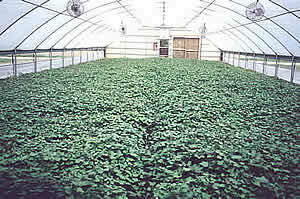 The micropropagated first generation seed potatoes are grown in field beds to make second generation plants, which become commercial potatoes and second generation seed for sale to other growers. 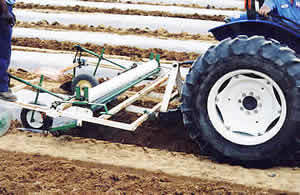 The seed potatoes are placed as close as possible without stacking. 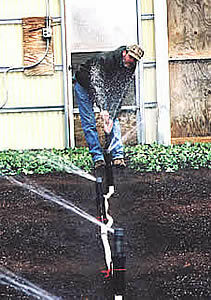 Two lines of drip tape are placed for irrigation as the seedbeds are covered with soil. 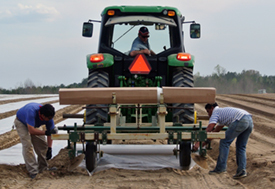 Finally, the beds are covered with plastic. .
G-2 plants come from the G-1 field seed beds. 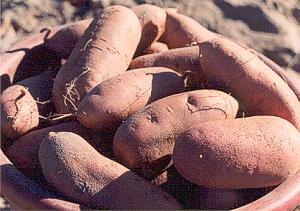 They are hand selected to ensure uniform, healthy plants that will produce high-yielding, good-quality G-2 sweet potatoes.